I generally read book series rather than stand alone books, but after reading the Legend series by Marie Lu, which I did enjoy, I was a bit sick of drawn out plots and more specifically, trilogies. 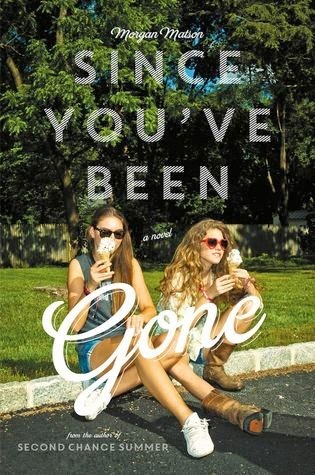 So I headed to Goodreads and stumbled across Since You’ve Been Gone by Morgan Matson, and it seemed to be everything I was looking for. A quick read with a fun plot. The only problem was that this was three months ago and the book was only released a few days ago. Needless to say I had a lot of anticipation for this book and I’m happy to day that it didn’t disappoint. The story followes Emily who is a very shy and socially awkward girl who is best friends with Sloane, who is glamorous, daring and charismatic. They have the perfect summer planned, but everything changes when Sloane and her family disappear without a word. Until a letter from Sloane arrives in the mail, containing only a summer bucket list for Emily to complete. This book is so good and in so many ways. The characters were probably my favourite aspect about this book as they were beautifully developed and very relatable, even if their names weren’t to be envied. (Sloane, Frank, Dawn? Really?) Names aside, I really enjoyed the way in which Emily’s perception of other people changed over time, particularly Frank and Sloane. At the beginning you see through Emily’s flashbacks that it was always Sloane and Emily not the other way around, with Emily going along with whatever Sloane wanted to do. But as the book goes on Emily’s thoughts and memories of Sloane become more aware of who Sloane was and she realises that her best friend isn’t perfect and that she doesn’t have to be like her. I really liked the way in which Morgan Matson did this as Emily didn’t like Sloane any less after these realised this, but simply became more sure with who she was as an individual. Emily also realises that Sloane needed her just as much as she needed Sloane and I found this really sweet and realistic, as we often don’t realise how much we mean to others as others show affection in different ways to us. I loved how through the List Emily was able to make new friends, grow more confident and feel as though she belonged somewhere. Because even when she was with Sloane Emily wasn’t entirely comfortable in group situations. I also really enjoyed how Emily’s perception of Frank changed as she got to know him and how their relationship developed. This book was often quite funny and had me laughing out loud more than once, which is something I always appreciate in a book and attributed to my love of the characters and their relationships. I also loved it how Emily wasn’t too obsessed with completing the List and how it didn’t become her whole life, but helped her find a new life with new friends. I loved the pacing in this book, nothing felt rushed, nor did it feel like it was dragged out.